Juan Macias (#1) was born in Mexico, probably in Ahualulco, San Luis Potosi, in June, 1855. He was the son of Juan Macias and Calistra Acevedo. He married Martina Hernandez on July 17, 1875 at Nuestra Senora de la Candelaria, Ahualulco, San Luis Potosi. She was born in Mexico in January, 1865. They immigrated to the United States probably late in 1890 (a) and lived initially in Presidio County. By 1900 they were living in Southern Brewster County, probably in the Lajitas area. Juan was working as a miner. They now had six children and were living in a tent, which, according to the census taker, was “mortgage free”. Another child was born while they were in the area. Juan and his family remained in the Lajitas area at least through April 1902, but soon after that they moved to San Vicente. They stayed there through 1910, when Juan was working as a ranch hand. While in the area, Juan purchased 160 acres of Section 9, Block18. Juan’s estate still had possession of this land in 1940. Soon after 1910 the Macias family moved to the Terlingua area. By 1920, Juan, now about 65, was not employed according to the census. In 1924 he was assessed $10.30 in state and local taxes. This seems somewhat high for someone who owned only ¼ of a section of land ($7.00 - $10.00 was fairly typical for owners of a full section with no significant improvements), suggesting the possibility that he may have owned additional land in the area. Juan died in 1927 and is buried in the Terlingua Cemetery. 1. Son Benjamin Macias was born November 27, 1890 in Sierra Mojada, Mexico. He married Nicolasa Levario October 28, 1911 in Terlingua. They were married by Justice of the Peace R.A. Wilson. Nicolasa was born December 6, 1893 in Shafter, Texas and was baptized there January 19, 1894 by Father Albert from St. Joseph’s Catholic Church in Fort Davis. She was the daughter of Jose Levario and Severiana Ramirez. Benjamin and Nicolasa were living with his parents in Terlingua in 1920. Benjamin was working for the Chisos Mining Co. (employee #74) on August 21, 1926, when his foot was badly smashed by a falling stull at #9. He was off work for 22 days as a result. His low employee number indicates he had been working for the company for some time, possibly as early as 1911. He continued to work for Chisos through 1939, probably later. In September and October 1939, G.E. Babb, Justice of the Peace Robert Cartledge’s assistant, wrote letters to the State Registrar requesting copies of birth certificates for 7 of Benjamin and Nicolasa’s children. It is unlikely that this service would have been preformed for a non-employee. Benjamin died in Medical Center Hospital in Odessa on March 17, 1958. Nicolasa died one week later in the same hospital. Both are buried in the Odessa Cemetery. (1) Daughter Olivia Ramos was born July 7, 1941 in Brewster County. She married Ruben L. Pineda in Fresno September 29, 1962. They were living in Fresno in February 2012. (2) Son Enrique Ramos, twin of Martina, was born March 23, 1943 in Alpine. He was living in Fresno in February 1992. (3) Daughter Martina Ramos, twin of Enrique, was born March 23. 1943 in Alpine. Martina died 20 April 1943 in Alpine and is buried there. (4) Daughter Estella Ramos was born January 5, 1945 in El Paso. She married Raymond R. Contreras September 29, 1960 in Fresno and they were still living there in February 2012. (5) Son Pedro Ramos was born November 18, 1948 in El Paso. He died in Fresno May 26, 2009. (6) Daughter Guadalupe “Lupe” Ramos was born in 1951. She married Ernst A. Ortiz April 23, 1971 in Fresno and they were still living there in February 2012.
a. Daughter Michelle Lee Labarre was born March 20, 1968 in El Paso. (2) Son Enrique Mireles, Jr. was born June 22, 1937 in Terlingua. His wife’s name is Delia and in February 2012 they were living in Fresno, California. a. Son Alberto Mireles, Jr. was born February 24, 1960 in El Paso. b. Son Raul Mireles was born April 15, 1965 in El Paso. a. Daughter Maria Teresa Rodriguez was born October 6, 1970 in El Paso. b. Son David Rodriguez, Jr. was born July 13, 1972 in El Paso. c. Daughter Yvonne Rodriguez was born November 29, 1976 in El Paso. a. Daughter Sandra Ann Lopez was born May 2, 1956 in El Paso. b. Son Jose Mario Lopez, Jr. was born July 21, 1957 in El Paso. (6) Daughter Maria Mireles was married to an Hernandez. They are divorced. In February 2012 she was living in El Paso. C. Son Sabino Macias (#1) was born April 28, 1916 in Terlingua. He was baptized in Chisos 4 June 1916 by Father M. Cuadrado. His godparents were Filipe Villalba and Maria Llanez. He probably died as a small child. (1) Son Panteleon Sanchez, Jr. was living in Sacramento, California in February 2012. His wife’s name is Carol. (2) Daughter Belinda Sanchez was born in 1955. She married Hilario DeHerrerra October 23, 1976.
a. Son Rene Carrillo was living in San Antonio in September 2010. His wife’s name is Jennifer. (1) Son Oscar Mendoza was living in Andrews in October, 2007. (2) Daughter Sylvia Mendoza was living in Odessa in October 2007. Her married name is Llanez. (1) Son Samuel “Sammy” Macias born February 24. 1966 in Odessa. He was living in Odessa in October, 2007.
a. Son Isaac Joe Tucker was born September 13, 1987 in Odessa and was living there in October 2007. (1). Daughter Rosemary Jordan was born in El Paso December 1, 1951. She married John Fulton and in February 2012 they were living in Summerville, South Carolina. (2). Son Edward Jordan, Jr. was born July 19, 1955 in El Paso. In February 2012 he was living in Summerville. (3). Son Kenneth Wayne Jordan was born July 19, 1955 in El Paso. In February 2012 he was living in New Haven, Connecticut. (1) Son Orlando Macias was born January 3, 1951 in Brewster County. His wife’s name is Irma and in February 2012 they were living in San Jose, California. (2) Son Benjamin Macias III was born in Brewster County December 8, 1951. In February 2012 he was living in San Jose, California. (3) Son George Macias was born September 10, 1953 in Brewster County. In February, 2012 he was living in San Jose, California. aa. Daughter Martha Macias Cruz was born March 10, 1977 in Brewster County. (5) Son Michael Martinez Macias was born July 15, 1958 in Odessa. In February 2012 he was living with his father in Alpine. (1) Son Guillermo “Willie” Longoria was born in Sinton, Texas July 21, 1951. He married Lucy Ramos and in February 2012 they were living in San Angelo, Texas. (2) Son Salvador Longoria was born in Odessa June 3, 1954. On September 16, 1983 he married Maria Rosa Melendez in Odessa. In 1994 they were living in San Bernardino, California. (3) Daughter Maria Elena Longoria was born in Odessa May 14, 1956. She married Santana Sarabia. a. Son Christopher Edward Longoria was born March 23, 1994 in Odessa. (1) Son Ricardo Macias was born March 26, 1956 in Brewster County. His wife’s name is Victoria and in February 2012 they were living in Carlsbad, New Mexico. (2) Daughter Alicia Laura Macias was born January 22, 1958 in Odessa. She married Rudy Holguin and in February 2012 they were living in Carlsbad, New Mexico. (3) Daughter Carmen Macias was born September 27, 1959 in Brewster County. She has been widowed twice, but details are not available. In February 2012 she was living in Carlsbad, New Mexico. (4) Son Juan Jose Macias was born in Brewster County September 24, 1961. In February 2012 he was living in Carlsbad, New Mexico. (5) Daughter Linda Macias was born in 1967. She married Edward Soto and in February 2012 they were living in Carlsbad, New Mexico. (6) Daughter Maria Felix “Bobby” Macias was born in 1971. She married Jason Nichols and in February 2012 they were living in Carlsbad, New Mexico. 2. Daughter Andrea Macias was born in February, 1893 in Texas. She was living with her parents in the Lajitas area in 1900. (1). Son Teofilo Macias was born October 6, 1947. In June 1995 he was living in Midland. a. Son Ronald Joe Garcia was born November 4, 1967.
b. Daughter Rhonda Macias Garcia was born February 4, 1969.
c. Daughter Roselda Macias Garcia was born October 4, 1972. (3). Son Manuel Macias was born May 4, 1950. In June 1995 he was living in El Paso. (4). Daughter Sylvia Macias was born April 7, 1952. She married Manuel Calanche, Jr. and in June 1995 they were living in El Paso. They had two children. a. Daughter Cristina Calanche was born May 21, 1972 in El Paso. b. Son Marcos Calanche was born July 5, 1977 in El Paso. a. Son Adam Ruben Gallegos was born January 21, 1988 in Odessa. b. Son Arthur Ruben Gallegos was born July 2, 1992 in El Paso. 4. 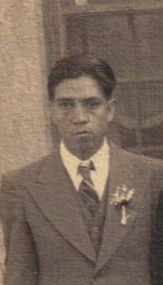 Son Jose Angel Macias was born in April, 1896 in Texas. He was living with his parents in the Lajitas area in 1900, in San Vicente in 1910, and in the Terlingua area in 1920. He married Anita Olivas circa 1925. She was born on July 26, 1908 in Terlingua, the daughter of Nasario Olivas and Soledad Ontiveros. She was baptized in Chisos, Texas by Father Brocardus on September 30, 1908. Her godparents were Jose White and Carmen Casteneda. Anita died in Alpine of tuberculosis on December 4, 1945 and was buried there the following day. By 1920 Jose Angel was working in the quicksilver mines. He was employed by Chisos Mining Co. (employee #379) at least from August 1927 through October 1936 (and very likely from 1920 into the early 1940’s).In August 1927 he was injured on the head by a rail in the cage at #8. He missed four days work. In 1934 he appeared in a very unusual “census” of all miners conducted by Chisos management.. The purpose of the “census” was to determine who had money and who did not. Jose appeared on the “have money” list; he claimed to have $15.00. A. Daughter Josefa Macias was born in Terlingua circa 1927. B. Daughter Justina Macias was born in Terlingua on September 17, 1927. C. Daughter Petra Olivas Macias was born in Terlingua March 27, 1931. D. Son Jose Macias was born in Terlingua on September 30, 1933. E. Son Guadalupe Macias was born in Terlingua on October 12, 1936. F. Daughter Andrea Macias was born in Terlingua on September 15, 1939. G. Daughter Consuelo Macias was born in Brewster County on May 8, 1945. 5. Son Antonio Macias was born in Texas in January, 1897. 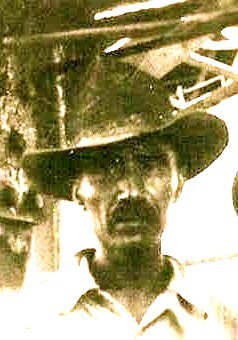 He was living with his parents in the Lajitas area in 1900 and in San Vicinte in 1910. A. Son Manuel Macias was born in Terlingua March 21, 1943. B. Son Isac Macias was born in Terlingua on June 3, 1944. He died on January 28, 1946 in Alpine, where he apparently had been taken for medical attention. He was buried later the same day in the Terlingua Cemetery by his father. C. Daughter Adelaida Marias was born in Terlingua on November 5, 1945. She died of bronchial pneumonia in Terlingua on December 31, 1945 and was buried in the Terlingua Cemetery the following day by her father. D. Daughter Elfidia Macias was born on November 29, 1946 in Brewster County. E. Daughter Aurora Hernandez Macias was born on June 28, 1949 in Brewster County. F. Son Ismael Macias was born February 11, 1951 in Brewster County. G. Daughter Maria Elena Macias was born March 27, 1952 in Brewster County. 7. Daughter Josefa Macias was born in Texas on December 29th, 1901. She was baptized in Lajitas by Father Brocardus on April 12th, 1902. Her godparents were Juan and Teresa Bernard. (a) There is conflicting information on the immigration date. 18990, 1900 and 1903 were recorded in census records. However, the third child, born in 1894, was baptized in Polvo, Texas in March, 1894. Therefore, 1890 appears to be the correct date. (b) His baptism record, dated April 12th, 1902, indicates he was born on November 27th, 1900. However, he was six months old when the census was taken in June 1900. Family information provided by Diana Longoria-Prado, Tony Carrillo, and many others. Eustacio Macias obituary, Alpine Avalanche June 8, 1995, from the obituary files at Archives of the Big Bend, Sul Ross State University. Alpine, Texas.